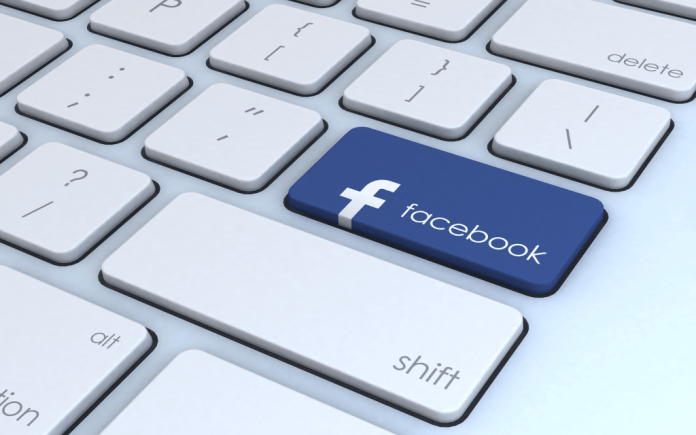 There’s more to Facebook content than meets the eye. Way more. Great content is always popular. With a unique video, an entertaining gif or an inspirational story; you potentially increase your chances of going viral. Heck, everyone scrolls down their Facebook newsfeed just to like and share the things that interest them. In social media, it’s fun when you master a content type. You want to build your credibility as a site with great food articles or entertaining videos, but it isn’t always good to specialize. When maintaining your own brand Facebook page, you’ll learn that sometimes you need a bit of variety. It’s not always good to stay the same. Spice things up with Snapchat stories, Instagram reposts or Youtube videos. Sometimes a little difference can help you stand out. If you’re interested in finding out more about content, then check out this list that features five best types of content that you can post in your social media page right now. The how-to type of content is a pretty popular format. You have probably seen tons of how-to videos on your newsfeed featuring mouthwatering food and stunning arts and crafts. It’s not hard to see why. People are constantly looking for recipes, tips, tricks and life hacks that they can try out for themselves. Great how-to articles make use of videos or pictures to illustrate the step-by-step process of making your product. These visual aids don’t just make your how-to article and video attractive. They also guide the audience in the step-by-step process of your tutorial. This way, you’ll be assured that your audience can definitely try out your tips and tricks. In fact, Hubspot found that people who followed directions with text and illustrations do 323% better than people following directions without illustrations. 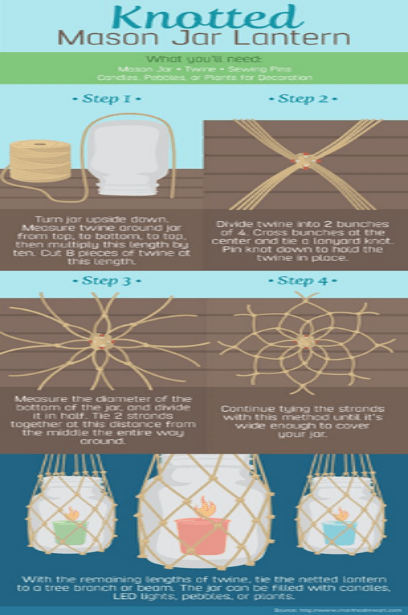 An added bonus of a how-to article combined with great visuals is that it’s shareable content. Once your audience can see and make the same attractive version of your finished product, they’ll be sure to share it on social media. Plus, your brand will attract more followers who will be looking forward to your future content. A simple way to get some inspiration is by checking out marthastewart.com. Martha’s site features recipes, DIY crafts and home décor tips, that you can recreate yourself. If you’re itching for more how-to types of content, then be sure to stop by Pinterest. The site is a collection of tons of how-to content. You can search and “pin” your favorite images and videos in your very own pinboard. How cool is that? Videos are pretty much everywhere. Your Facebook, Instagram, Snapchat and Twitter are probably filled with them. Heck, you probably spend most of your time watching videos in your downtime. And you’re probably counting the days for your favorite vloggers’ next video. Done well, a video can share a relevant message in a very memorable way. There’s nothing like a great video that can instantly lighten up your day. A study from Emarketer tells us that Americans spend 5.5 hours with video content each day. So, based on this, you can tell that everyone loves a good video. Your business may very well be a part of the 65% of U.S marketers that plan to increase their mobile ad budgets to account for more videos, according to Hubspot. One example of a brand that makes viral videos is P&G, Proud Sponsor of Moms. 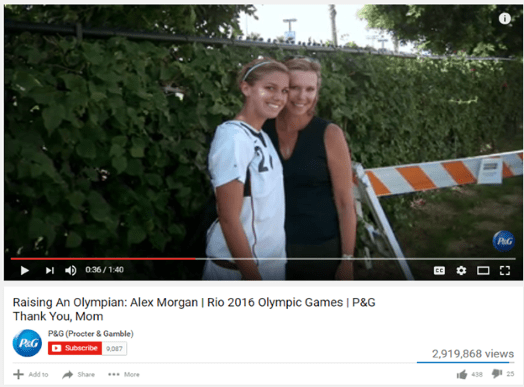 For the Rio Olympics, P&G relaunched their award-winning Thank You Mom campaign. Their videos feature the Olympian’s mom narrating the challenges and the victories that Rio’s Olympians have faced. If you’re looking for the backstory of some of your favorite athletes, then you can watch it here. Infographics definitely make a lasting impression. According to Hubspot, infographics are liked and shared on social media 3X more than other any other type of content. Their eye-tracking studies also showed that internet readers pay close attention to information-carrying images. So, it’s safe to say, with the right infographic your message can definitely go viral. When done right, a good infographic can entice your audience to look and understand your concepts and ideas. They’re also more likely to read your research, data and statistics. After all, who doesn’t enjoy an informative yet visually stunning piece of data? Once you think that your content would look great as an infographic, you should try it out. Don’t be intimated if you’re not a Photoshop guru. There are tons of new tools that can make creating infographics pretty easy. What I recommend is Canva. They have tons of infographic templates that you can spice up with their diverse collections of fonts, illustrations and images. Still not convinced? 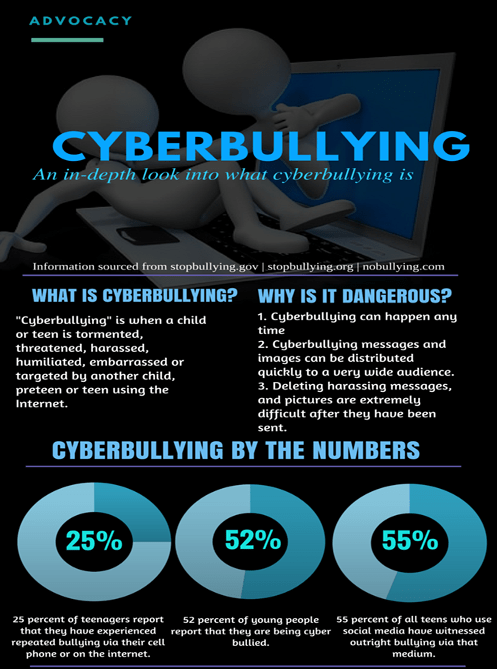 Check out this cyberbullying infographic that I made in Canva. We’ve all heard the saying that “A picture is worth a thousand words.” After all, that’s the motto of every photographer who’s after the bold story, the unforgettable image or the perfect moment. 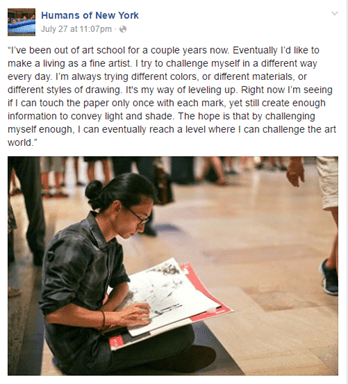 Even if you’re not a photographer, you’ve probably scrolled down in your newsfeed in search of it. You scroll and scroll until you’ve found an interesting image. Once your interest is piqued and you fall in love, you’ll hit the Like and Share button. No one knows the formula for the perfect image. But between looking at the picture and pressing the like button, is that one moment where you look towards the caption. You are compelled by the pictures behind the story. That’s probably why millions of people are attracted to the allure of Humans of New York. The site features powerful photos with eye-opening stories, which remind you that not everything is as it seems. The photos are taken by Brandon Stanton, as he walks through the streets of New York, while talking to strangers. Creating powerful photos is easy, once you know where to look. Consider taking photos of what goes on behind the scenes of your brand. Better yet, get your employees to share their own stories. These days everyone’s in search of personal stories or quotes that can touch them. So, it makes sense that the right photograph will add a trace of authenticity in your brand. For some successful examples, be sure to check out the ‘Celebrating Life’ campaign made by the Himalaya Sparkling White Toothpase, a brand from The Himalaya Drug Company. The images were taken by street photographer Siddharta Joshi. 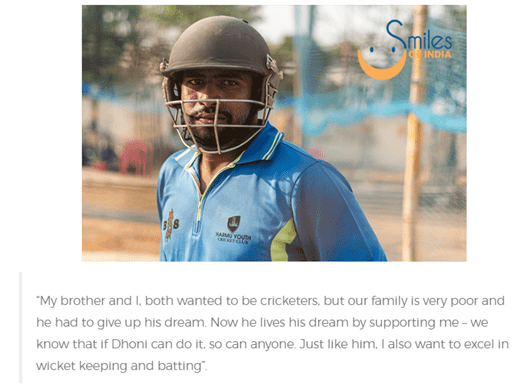 The campaign aimed to spread smiles by collecting exceptional tales of hope and inspiration across India. GIFs (or Graphics Interchange Format) are now dominating the Internet. After all, who doesn’t love sharing a funny and eye-catching GIF? When done right GIFs are not only a potential boost for engagement, but they also let you entertain your audience. GIPHY – select a GIF from their vast collection and post it on Facebook. One glorious example of using GIFs in the field of content marketing was made by the Huffington Post. 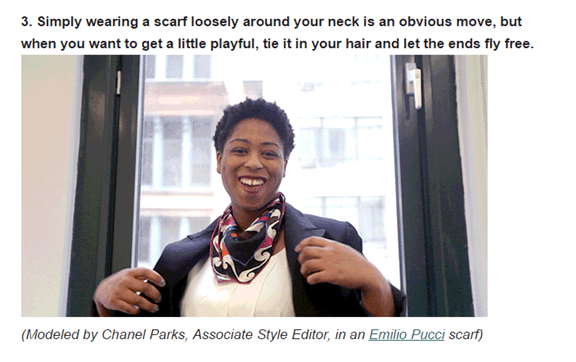 The site’s fashion editors created GIFs to show their audience the five ways to wear a scarf. So, based on this, we now know that GIFs aren’t just good for entertainment. They’re also a great way to illustrate your ideas in your article. As you’ve learned from the list, there’s a lot of potential in various types of content. Knowing which type to use and how to use it will significantly increase your chances of conveying your brand’s message. After all, when it comes to social media it’s a lot better to be a Jack-of-all-trades. Got any other types of content that you would like to add to the list? Don’t forget to comment them down below!